Wash animals in M9 buffer. Slowly apply 200 µl of worms to moistened 7mm X 10mm rectangles of Millipore HA filter paper (0.45 micron pore size; this filter will dissolve in acetone) while paper rests on glass fiber filtration unit under weak vacuum and add 0.5 ml of M9. Immediately place this onto wet Whatman filter paper that is positioned on styrofoam freezing disk supplied with the Reichert MM80E slam freezer. Attach paper to plunger and slam worms against cold copper block (in liquid nitrogen). Transfer freezing disk and worms into dewar of liquid nitrogen. Transfer specimen into mesh basket while submerged in liquid N2. Hold frozen sample at -90°C for 48 hours or more in primary freeze substitution medium: 1.0% OsO4 in acetone. Warm sample to -60°C in same fixative over 16 h period. Warm sample to -30°C in same fixative over 4 h period. Warm sample to 0°C in same fixative over 1 h period. Transfer sample to 100% acetone two times at room temp, 10 min. First change is in 1 part resin to 1 part acetone, allow to sit 30 min. Second change is in 2 parts resin to 1 part acetone, allow to sit for 30 min. Third change is into pure resin and hold 1 hr. Fourth change is into pure resin and hold overnight. The next day, place samples in fresh resin at rt and place infiltrated worms between Aclar sheets. Excess sample is embedded in eppendorf tubes. Cure samples in 60°C oven for 3 days. Cut best worms out of thin embedment and re-embed in resin and re-cure. Weigh each of the above solutions dirrectly into a bottle and violently shake to mix. These stock solutions are stored at 4°C, and brought to room temperature before mixing the final resin, then finally adding DMP-30. 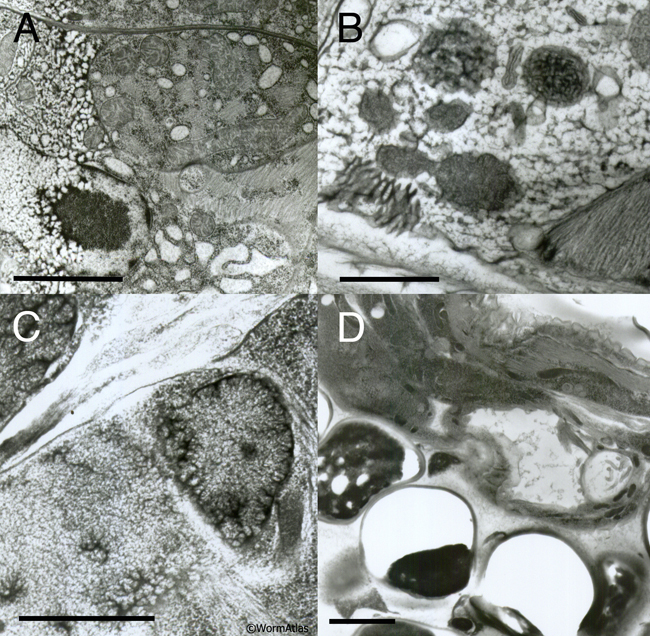 The presence of ice artifacts is often most evident at cell nuclei, but may look worse in one portion of an animal than another. EMSlamfreezeFIG 1: Freeze artifacts typical for HPF/FS or Metal Mirror fixation. A. Nematode frozen by metal mirror fixation, where left side of the worm shows severe distortion due to poor freezing, while pharyngeal tissues on the right are better preserved. Scale bar, 2 µm. B. High-power section through the hypodermis. Extreme distortion of most organelles (dark objects) was caused by extensive ice crystal formation. Cytoplasm is virtually white in color due to ice. Scale bar, 1 µm. C. Higher power image showing starry-like dark fingers radiating outward from many objects. The dark fingers are distorted protein and lipid isolated by intervening fingers of (clear) ice crystals. Such defects are accentuated over a nucleus (right side of panel). Ice damage after HPF often looks like more subtle versions of the defects seen in B and C. Scale bar, 1 µm. D. Low-power image showing nematode (above) embedded lengthwise in yeast paste (below), where individual yeast cells have failed to freeze or embed well, leaving either an empty hole or a shriveled wisp filling one side of the hole, thus weakening the plastic section. The worm also looks distorted. Similar clear holes may form at worm embryos inside the mother if resin infiltration fails. Scale bar, 2 µm.